All Hayden concertinas are of course modern instruments, since Brian Hayden only devised the system in 1963. Like all Duets they can come in a range of sizes. 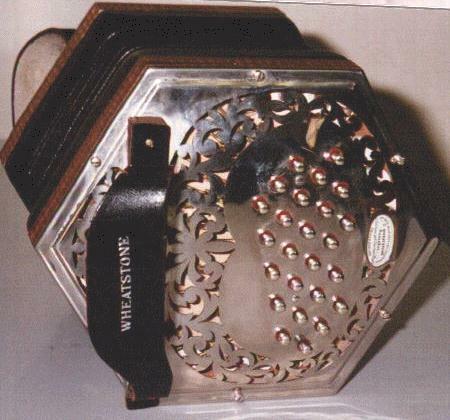 This instrument, made by Steve Dickinson under the Wheatstone trademark, has fewer buttons than the Dipper and thus a more restricted range, but is also lighter and thus more suitable for singers and other players who want to stand while playing. Both are excellent instruments, from makers producing instruments as fine as any ever made.